Lunch, dinner, basically any time a meal sized hunger pang hits. We all need an easy back pocket meal that flies together with minimal effort while still scoring high on the tastiness scale. 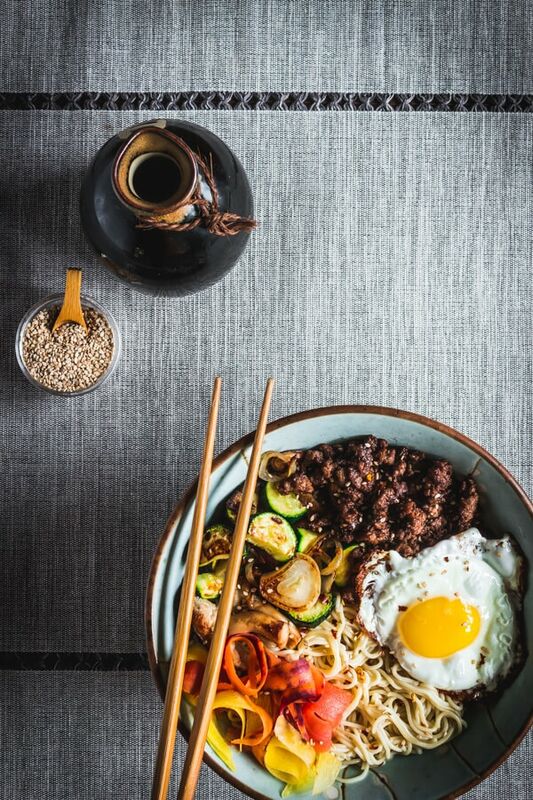 Right now I am living my best bowl food life on repeat with this gluten free and oh so very Simple Beef Bibimbap Ramen recipe. 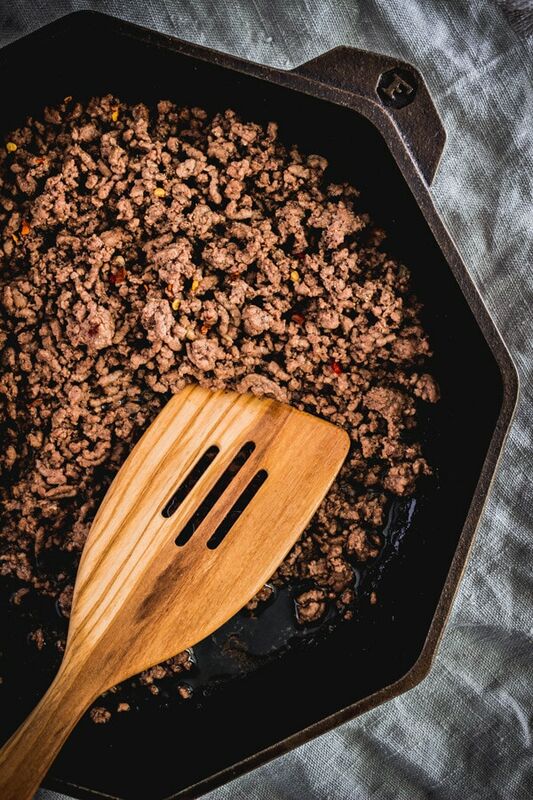 Think savory ground beef and sautéed zucchini, shiitake mushrooms, and shallots. Rainbow carrots peeled into thin, crunchy ribbons. A fried egg with a saucy yolk is a must -> ALWAYS. And serve over ramen. You with me on this one? It’s a bowl of umami magic. I recently visited a ramen restaurant who says they strive to make the best ramen in all of Portlandia. Awesome, count me in. Chopsticks ready. My visit lasted 20 seconds. No ramen for you they said with nose upturned, a scowl on their face, and a deep exhale of irritability. Apparently asking for gluten free ramen was considered offensive. Or at least at this one little corner of Portland. Portland is actually a mecca for gluten free inclusivity. I guess they didn’t get the memo. They also didn’t get the addendum to the memo that the majority of us who are gluten intolerant didn’t willingly choose that path of foodie life. We succumbed to our gluten free lifestyles kicking and screaming while all the tasty bread, pizza, pasta, baked goods, AND ramen were stripped from our hands. So LISTEN UP ramen restaurant, you can save your snark for someone else. I’m taking ramen into my own hands. So hop on the gluten free ramen train friends. Organic millet and brown rice ramen is in town. And it’s darn tasty. 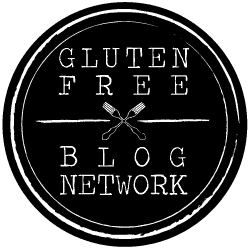 Thankfully there are companies (and more are regularly joining the ranks) who have the gluten free-ers in mind. 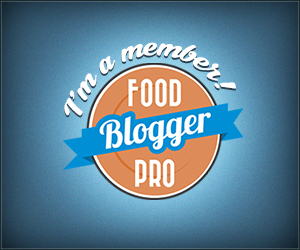 Lotus Foods is one of them. (This is not a sponsored post btw, just my affections pouring out). Lotus Foods has my back when I’m craving a bowl of soul comforting gluten free ramen. 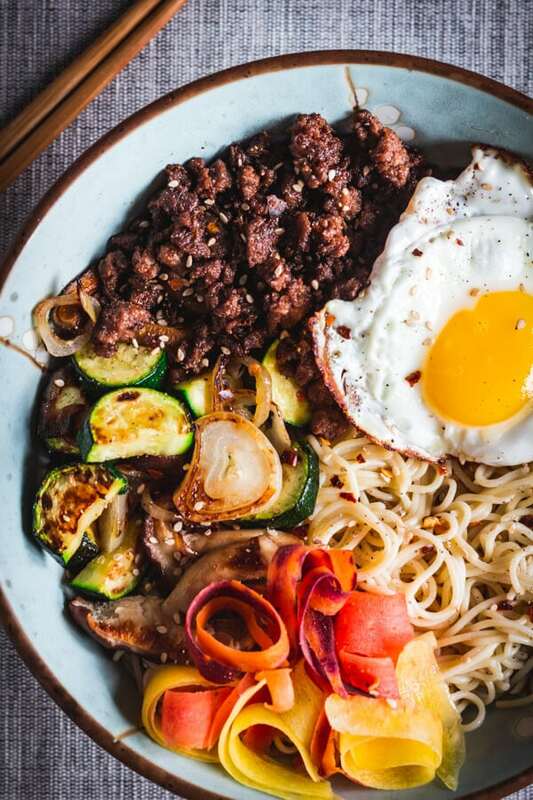 This Simple Beef Bibimbap Ramen is a perfect weeknight meal when you want something soul comforting and hearty on the table fast. I also love making it for lunch when I want something that’s quick and easy, filling, and full of flavor. 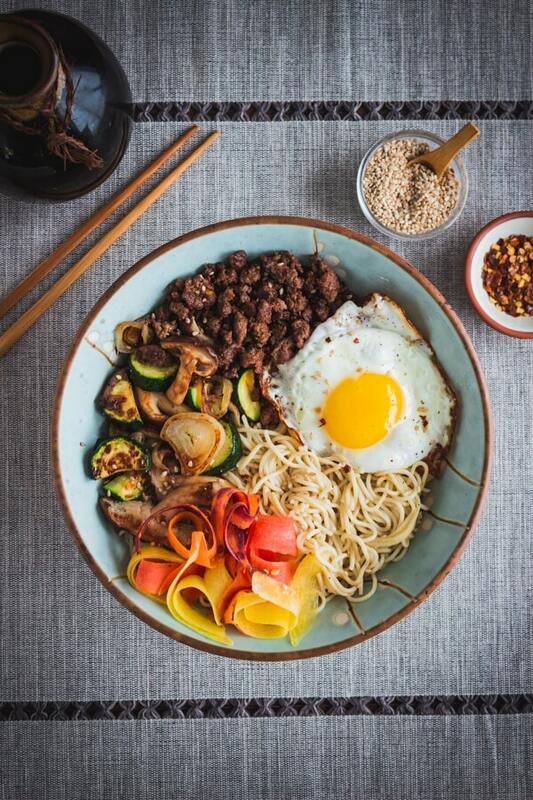 Bibimbap (pronounced BEE-beem-bop) is traditionally served over a bowl of rice (which would also work for this recipe) and then you take all of your bowl components and mix them in with the rice to incorporate all the flavors. But I’m switching things up a little because I love noodles. This rice ramen bibimbap variation has definitely become one of my meal planning go-tos. It’s a pan to plate meal in less than 30 minutes. Let’s break it down. Sauté some veggies. 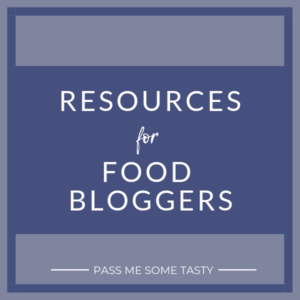 I used zucchini, shiitake mushrooms, and shallots but you could really use any veggies you have on hand. 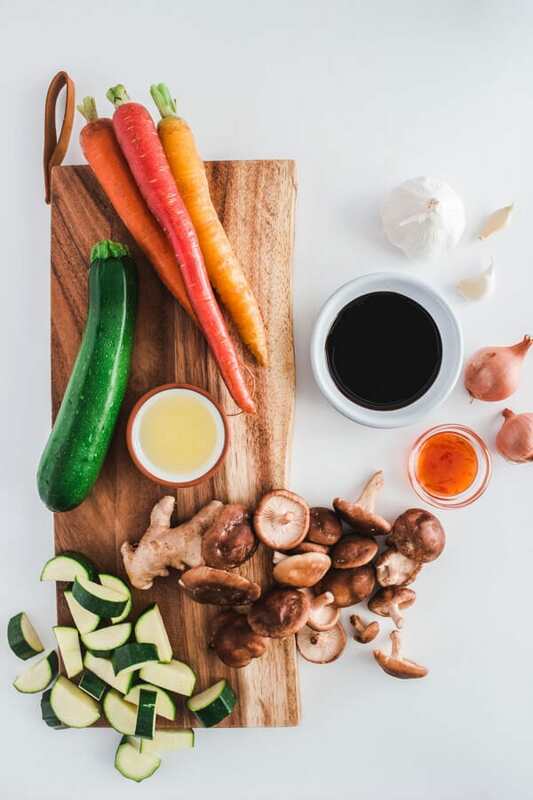 I also peeled rainbow carrots into thin ribbons and left them raw for a little extra crunch of sweetness but you could quickly sauté them as well if you prefer. Brown the ground beef in the same pan used to sauté the veggies. Then add the sauce. Let’s pause here and talk about THE SAUCE. 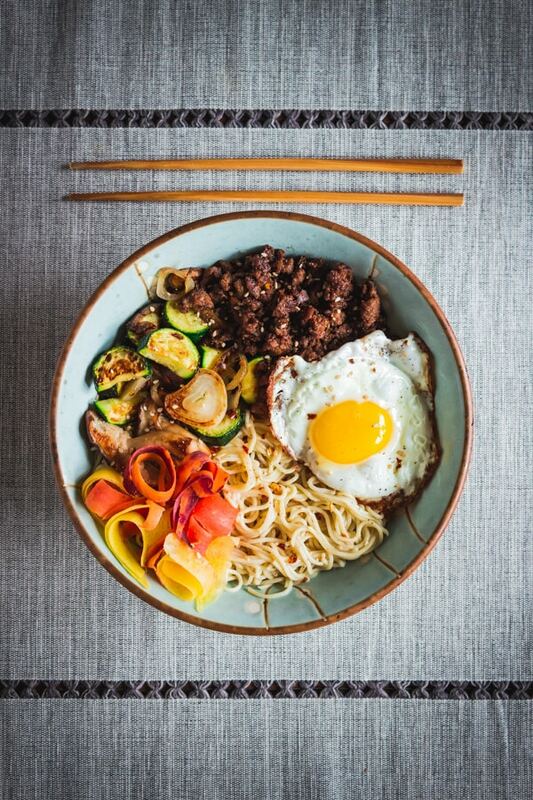 The sauce is what brings this simple bibimbap ramen bowl all together. 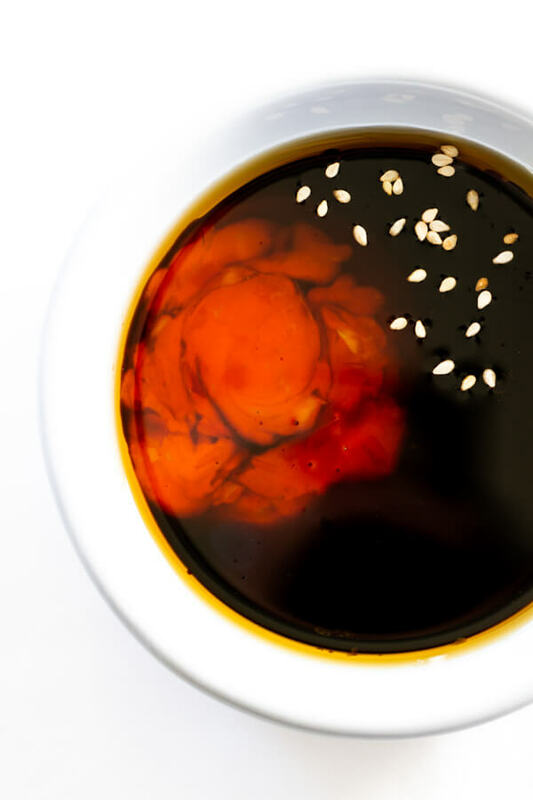 Sesame oil, garlic, sweet red chili sauce, ginger, and liquid aminos (tamari would also work) take this bowl food to a lunch or dinner time craving on repeat. It delivers the umami magic. Serve the veggies and the savory ground beef over a steaming bowl of ramen along with a slurpy yolked fried egg on top! 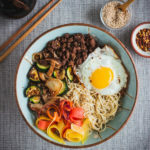 Just like traditional bibimbap that is served with white rice you must mix it all up so the umami magic can work its flavors throughout the whole bowl. And that’s it! And how did the ramen restaurant visit end? I went to the restaurant next door. They serve gluten free Korean food. They mentioned that the ramen restaurant has A LOT of people asking them EVERY DAY if they serve gluten free ramen, which according to the Korean restaurant is why they are a little snarky. 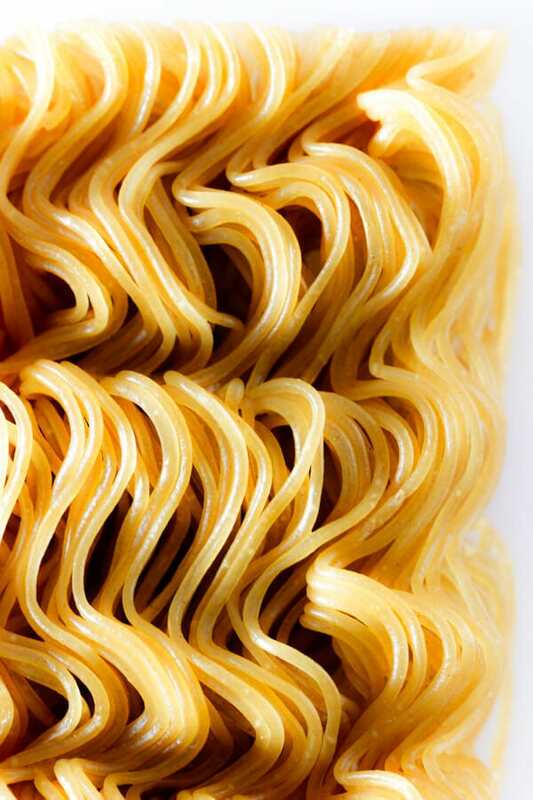 Maybe it’s time to hop on that gluten free ramen train. You with me on this ramen magic?! This recipe was well loved by my whole family. Thanks Shannon! 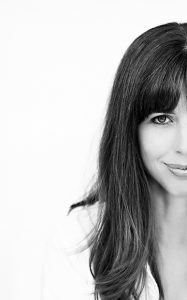 Thank you so much Leslie! I am so glad you all loved this recipe! This was relatively easy and delicious. I even made up a sweet red chili sauce substitution on the fly (a bit of garlic chili sauce, sriracha, and a touch of sugar in case you’re wondering), and it worked. I also sautéed the carrots for a few minutes (separate from the other veggies), but with the delectable sauce, I know it would be hard to mess this up. I’m so happy to hear you enjoyed this recipe Hillary! Thanks so much for this comment Miranda! I love that you made this recipe work for your lifestyle rather than ruling it out because it wasn’t vegan. And I’m SO glad to hear that you and your family enjoyed it! My whole family loved this, even the 3 year old! I didn’t have a shallot and I grated the carrot to make it more child friendly, but it was still a hit. This will be added to our regular meal rotation for sure. Doesn’t that just make your heart sing when your kiddo gets on board with what you’ve cooked up?! So happy to hear your whole family loved this!